"Top ERA Broker in the entire State of Florida"
Kim decided to move to Gulf Breeze, a Gulf Coast community, in 2001 to provide a better quality of life for herself and her family. Drawn to the Florida Panhandle for its A-rated schools, beautiful beaches, sense of community and proximity to her extended family, Kim, and her husband settled into a slower pace with a focus on family life. After attending Tulane and then working for a large oil field service company in Houston, she decided to put her years of corporate marketing skills to work for herself. 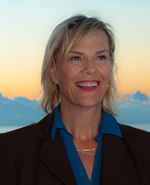 Kim earned her Florida real estate license and became a Realtor in 2002. She later became a real estate broker in 2004. Kim founded Emerald Coast Realty, in Historic Downtown Pensacola, FL in 2005 with the help of her husband William, a talented photographer and internet marketer. After working as Managing Broker for many years, she decided to get out from behind the desk and get back to working directly with families, prospective homeowners and sellers in 2011. Kim is now a top producing agent and has received recognition by the Women's Council of Realtors "Top Gun" distinction, ERA's Beyond Excellence and in 2015 was the top ERA Broker in Florida. She loves her job; helping her customers with their real estate needs.